This guide will help you choose, install and maintain laminate flooring in your home, office, commercial or public areas. Before you decide taking on this challenge be aware that this is not an easy job. We class this type of project with a difficulty rating of ‘medium’ requiring an intermediate level of DIY skills. This guide will help you choose, install and maintain laminate flooring in your home, office, commercial or public areas. Before you decide taking on this challenge be aware that this is not an easy job. We class this type of project with a difficulty rating of ‘medium’ requiring an intermediate level of DIY skills. - Protect your eyes to avoid contact with particles by wearing safety glasses while using machines such as circular saws and jigsaw or mitre saws. - Protect your knees from kneeling for extended period of time by wearing knee pads. 1. Is laminate flooring a suitable choice? Before buying the product you need to establish if your space is suitable to accept the particular type of laminate flooring you intend to purchase. Although laminated flooring are water resistant, areas such as bathrooms and kitchens require a more water tight grooves and click systems to avoid water seeping through the edges of the planks. In these cases you may want to consider laminate flooring tiles. a. Measure the widest length and width from wall to wall making sure you go deep into chimney breast recesses and any bay windows you may have. b. Multiply the two measurements together to calculate the area. c. You will know how many packs you require by diving the pack coverage area into your room area. If you get a decimal point e.g. 17.56 you should purchase the next whole pack as in this example it would be 18. It is important you understand the significance of thickness, type and finish of the flooring product as it will be particularly suited for different areas. Laminate flooring is a machine processed product made from wood particles with a photographic film layer at the top to achieve a desired effect. Unlike real wood floors they do not have a natural wood layers so therefore can’t be sanded or treated. 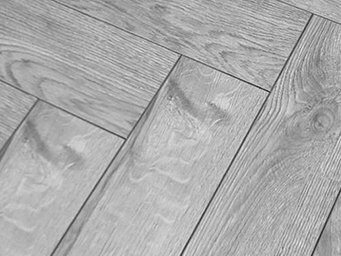 Laminated flooring is water-resistant, suitable for areas with central heating and log fires, and easier to install compared to solid and engineered wood flooring. An easy way to choose your product. Browse through the full range of laminate flooring products available to get an idea of the types of colours and shades available. Once you know the shade of colour you like you can filter all the products down to that particular type of colour and thickness. Your final decision will be based on the amount you want to spend so choose something within your budget and take advantage of the reduced prices to get good value for money. An underlay adds sturdiness, insulation and provides a protective layer above a sub-floor or boards. Lay the underlay side by side across the entire floor trimming the edges to fit against the wall but make sure you leave a 10mm-15mm gap around pipes to allow access and avoid any unfortunate dampening from leaks. HDF cores with one thing in common, a laminated photographic image or graphical top layer that is designed to give the finished look of wood or any desired effect. Only 3mm thin, doesn’t provide much insulation but may do the job if the areas is already well insulated and floors that are dry and level. Thicker 5mm underlay made with combined and more structurally resistant material providing reasonable insulation. It can mask over slight irregularities and unlevelled floors. For the above types make sure you tape the edges of each strip together to keep it damp tight. Ideal when you have floorboards or uneven sub-floor and good heat and sound insulation is an important requirement. Leave the underlay inside the room for 24 hours allowing it to naturally acclimatise by expanding to its desired form. As this underlay may expand Leave 10mm gaps around the edges of the room walls and 5mm in between each piece. A decorative feature suited for areas desiring a cosy and homely feel to the room. If you already have skirting be sure you have enough space to install the laminate flooring under. This is the easiest option as you can simply nail the strips of beading directly above the flooring and they can be useful to fill any gaps left under a skirting board. A door bar may be necessary if two adjoining areas have different floor height and this strip can mask the uneven joins and also lift the gap on the closing position under the door. Pipe surrounds neatens the finish in case you have a jiggered circular cut or larger than required gap around pipes. Ensure that the concrete is moisture free by using a moisture meter or compressing a polythene film material with a heavy weight on top of the concrete floor for a 24 hours to see if the film has dampened or discoloured. If you find damp or moisture you must seek professional help and advice and resolve any moisture related issues before laying your flooring. A synthetic floor that is manufactured from different profiles. The concreate surface must be flat. Any small uneven areas can be levelled out using fibre board by If you have any ditched areas deeper than 2mm you must fill these using a compound you can buy in all major home improvement stores. Laminate Flooring is the most popular choice of flooring because of the extensive range of colours and designs, it’s good value for money, hard wearing, easy to install and maintain. Newly laid concrete floor must be fully dried. Do not rush your flooring installation and ensure you have allowed at least 7-8 weeks for the concrete to fully dry depending on the thickness of the concrete. Browse our laminate flooring sale for the best offers and you can order a few samples to try before you buy. Once you satisfied the above lay down a layer of damp proof membrane (DPM) all over the concrete overlapping the edges to avoid exposing the concrete with movement when laying your underlay and flooring. Make sure the wooded boards are flat not exceeding any more than 2mm in variation of height as these can be levelled out by fibreboards. Make sure the timber is dry and damp free. If you spot any signs of moisture you must replace the planks and nail them down securely. If you find some boards are creaky or lifting this is the best time to replace or nail them down firmly. Please note that the following steps are a general guide to laying your laminate flooring but you should always read the manufacturer’s instructions before continuing as there may be some specific advice related to the product. 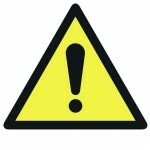 Choose the most appropriate underlay according to the conditions of the sub-floor. If you are continuing with an open plan area or if you have laminate flooring in adjacent rooms then you should align your planks in the same direction otherwise in the case of a rectangular shaped room lay them in the same direction as the longest wall in the room. If you have a relatively square room it is best to lay in the direction towards the light entering window or door. i. 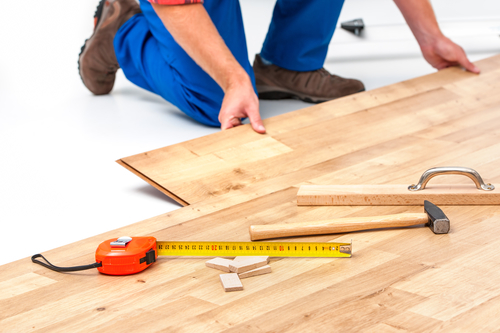 If you already have skirting that is not desired, remove before starting to lay your floor. If not ensure there is sufficient gap under it to fit the flooring. ii. Make sure the area is clean and dirt-free. i. You will notice either side of the plank has slightly different patterned edges. One side will be a “tongue” and the other will be a “tongue and groove”. The opposites are designed to fit the planks together helping them to stay down. If you product doesn’t “click” and lock together on the edges you should apply adhesive to fix the edges together. ii. Start laying from a corner in the direction you have decided with the “tongue” facing the wall. iii. Use approx. 12mm wide spacers in between the wall and plank at 50cm intervals (check manufacturer’s instructions). iv. Complete the row sawing off the end after marking it straight using a combination square. v. Using the off cut left from the previous row, position it next to the first plank you laid down so that the bottom line is not in line to the adjacent plank creating jiggered horizontal lines with at least 35cm difference. vi. Make sure you join the opposite grooved edge to lock the planks into place. vii. Work your way down the row and repeat steps (iii) to (vi) going across the room row by row firmly pushing by hand or tapping the planks against each other using a mallet if recommended by the manufacturer but be careful not to apply too much pressure causing them to lift up at the joins. You will most likely have an odd space remaining between the last row you have laid and the wall so each plank needs to be marked individually for cutting. There is a clever method on getting this exact because not all walls are straight so follow these steps carefully. i. Starting from the bottom or top, position a spare plank directly aligned over the previously laid one making sure the gap is still fully revealed as before. ii. Then lay another plank on top of that one but pushed firmly against the wall covering the entire gap. iii. Using a pencil mark a line against the edge of the top plank so you are marking the plank beneath it which is the one you positioned directly above the originally laid plank. iv. Cut the plank you have marked and using a mallet tap it tightly into the gap. Work out how much gap you need to saw from the bottom of the architrave or mouldings. You can do this by slotting a thin ruler in the gaps created against the wall making sure you hit the sub-floor or calculate the depth of the underlay and flooring planks and in either case make sure you add another 2mm to allow for movement. v. Repeat the same process (i) to (iv) going along the final row against the wall to cut out the each plank exactly measured for the required gap all the way across the wall. Saw off the amount required to slot the flooring planks firmly under the architrave or moulding. Mark the position of the pipe over the flooring plank. Remove the spacers, use the floor and allow it to expand over a few weeks to see if the gaps bother you. In either case you can finish off the edges by nailing down trips of scotia beading around all the walls or just around certain areas such as fire surrounds, patio doors or any steps you may have. Using a wood drill bit of at least 10mm larger than the pipe diameter drill out a whole from the laminate in the position of where the pipe will fit through. Starting from the edge of the plank at a wider point draw an angled line coming into the edge of the circle on both sides. Using a mitre saw, along the lines and you will release a triangular piece with a curved bottom. Place the flooring plank to fit around the pipe and place the cut out triangular piece behind the pipe against the wall to finish off neatly. Do not glue the edges in case you need to free the space for any pipe maintenance. If the laminate flooring meets carpet or permanent rug such as in a hallway in front of the door use a metal strip to safely avoid either materials lifting up and creating a noticeable edge to avoid tripping over. Replace the spacers with pieces of cork which allow the laminate flooring to expand and contract instead of leaving a gap which may cause the planks to move and bulge at the joins.